Catastrophe is an online game in which players can push, pull and remove elements from famous structures until they collapse. Developed as part of the Push Me Pull Me family of simulators, the impetus to create the game arose as part of a commission from the Institution of Structural Engineers to create an exhibition stand for the Big Bang Fair that would attract young people to structural engineering. The idea was that at the stand students would build and test cardboard models of simple structures and then be able to test then be able to test some virtual models of famous structures. Gennaro Sennatore, the person leading the Push Me Pull Me initiative, was already working at the time on a real-time structural solver capable of allowing people do draw structures on screen and test them. It only took a little more imagination to turn that solver into the game Catastrophe. 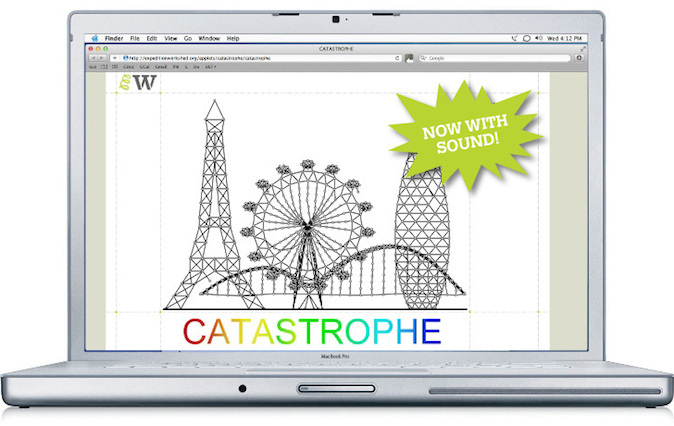 While initially aimed at children aged 11 – 15, Catastrophe has proved a popular learning tool for undergraduate engineers and architects, especially in ‘sandbox’ mode, where students can create and test their own structures. The popularity of Catastrophe was instrumental in securing the funding for our Structural Games initiative.